All of our dips are individually packaged for freshness and quality. Our herbal ingredients are certified organic or certified naturally grown, and no sugar or salt is added. These dips can be made dairy free/vegan also. They are flavor-filled and delicious! 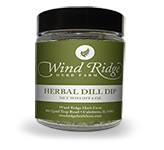 Our dips can be used as salad dressings, marinades, seasonings, soup starters, added to mayonnaise for sandwiches and herb butters. Ingredients include fresh dill, onion, parsley, with a light herbal seasoning. You have never tasted a dill dip so fresh. Is wonderful with veggie trays, chips, crackers. The fresh dried veggies and hint of garlic make this dip our biggest seller. We have even had people use this as a seasoning in soups or casseroles. It is great with veggies, hollowed out loaf of bread, crackers, or whatever strikes your fancy. If you like garlic, you will love this dip. The combination of tomatoes and basil with the garlic are like a trip to Italy. Great on crackers, chips, or pretzels. Mix with cream cheese & canned pumpkin for a great seasonal treat. Serve with fruit or graham crackers. Hungarian paprika, cayenne, garlic, and onions are the ingredients in this dip that has a mellow flavor to start off and ends with a nice burn. Zesty combination of herbs commonly found in salsa with a nice spicy finish from the jalapenos-but not too much. Tomatoes, onions, garlic and more. This is a Garlic LOVERS Dip. The longer it sits, the bigger the bite! Garlic, onions, chives make this dip a hit. Locally sourced horseradish is so flavorful you won't believe it. Also makes a great marinade/sauce for roast beef, prime rib or with any vegetable. Just the right balance of sweet and hot. Perfect blend of jalapeno's, cayenne and sweet peppers. Serve with tortilla chips or your favorite vegetables.